The team’s deepest desire and ultimate inspiration is to create a game that we, and the community, want to play. We want to create a game that is just as unique as it is entertaining; something that will always keep you coming back for more. 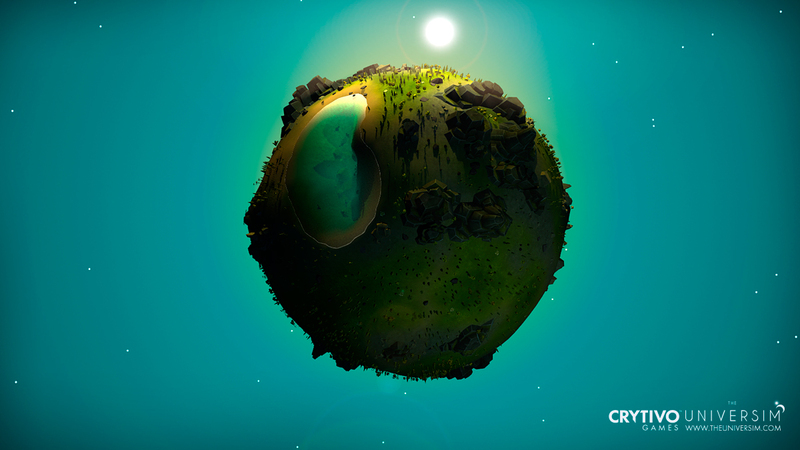 The Universim aims to unleash you upon the universe with the powers of a god to begin forging your galactic empire in the stars. The ability to play as a god gives you unparalleled power, but unlike other god-games, you cannot interact directly with your population in the game. However, you can influence their decisions and change the way in which your civilization evolves. It is up to you to decide which technology path they follow and what kind of research they undertake-you have the power to shape their future. Instead of taking control of a static game world that awaits your every command, life will go on as you would expect. You are effectively taking control of a living simulation. Like a ball of clay on a potter's wheel, the world will keep spinning, but you will be there to mould it to your liking. Although, the ball of clay may or may not slap your hand away at times. Your civilization will begin in the Stone Age and steadily progress, advancing beyond the modern era, then moving into the age of intergalactic exploration and colonization. The game will feature a similar evolutionary path to the human race, but players will have the tools to shape their civilization’s progress. You will need to think carefully when making decisions about things such as their research path. Some things may be far more important than others, depending on the situation and era. Even though you may think that fancy new gadget is worth dying for, you will also need to consider how it could be used while your people are slowly turning into fossils. Buildings and society will evolve as you progress from era to era; certain special buildings will become available once you research a particular technology. Buildings will begin to spring up around what we call The Epicenter, the central heart of every city in the game. You can place an Epicenter in any feasible region on the planet that supports cities, and buildings will begin developing around it as your population grows. The buildings are constructed by the AI and thus are built dynamically around the Epicenter, meaning you cannot select where they are built. However, you can still place special buildings wherever you want to! Buildings will grow dynamically based on the conditions around your Epicenter. In certain environments, your population and buildings will grow faster, but in cold environments, deserts, and other rather inhospitable areas, food may be scarce and therefore will hinder development. 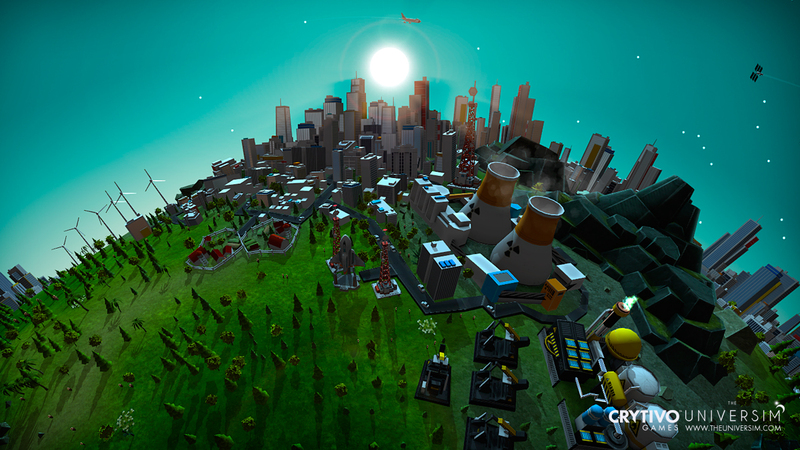 In The Universim, resources play a major role in the game; they govern the integrity and growth of your civilization. Resources can be used in various ways: to create new technologies, to expand your empire, to research exciting or life-saving inventions, and to help your civilization’s advancement through the ages. This is what makes intergalactic exploration so much more important in the space-age! Every planet you encounter in the game will be as unique and vibrant as the last. You will come across planets with varying temperatures and environmental conditions as well as a wide range of characteristics that make them incredibly special. Planets will also undergo the changing of seasons which can affect the many environmental biomes on the planet. It can cause rapid changes in temperature and conditions. This can have a major effect on the gathering of food and resources as well as the development of buildings. The game will keep track of the time and date, and will change the seasons according to the in-game timeline. Summer offers the best food yield and growth period due to its favourable weather, while winter can bring many negative effects. Some winters may go by quickly, while others will drag on. Fortunately our in-game News System will inform you about upcoming winters. So you better prepare for long winters by storing food in advance. Failure to do so may starve your civilization to death over the course of the season. Colonizing a planet requires a little preparation beforehand. The Go button is not the miracle button, unfortunately. There may be a few issues that will need to be resolved first. If adequate research about the planet is not done, it may result in the untimely demise of your colonization team. It can be rather difficult to walk on molten lava while fending off giant space mosquitoes with nothing but a can of sunblock! Particularly while wearing the previous mission's sub-zero equipment. In order to keep track of all of this information and help you to explore the universe more easily, we came up with a simple way to manage your galactic endeavours; by clicking on any star in the sky, you can utilise our intuitive GUI to quickly navigate the various planets represented by the stars and reveal extensive details about them, like how far away they are and what kind of conditions you can expect to find. This will allow you to discover new planets and colonize them if you have the right technology. There will also be a number of unlockable and upgradeable options available here. For example, you can research an all-terrain Rover that can be sent to recon a new planet. The Rover will be able to provide more details about the planet’s conditions, environment, and the various resources it possesses. This can be incredibly helpful when deciding whether or not you want to colonize a planet or move on to the next. 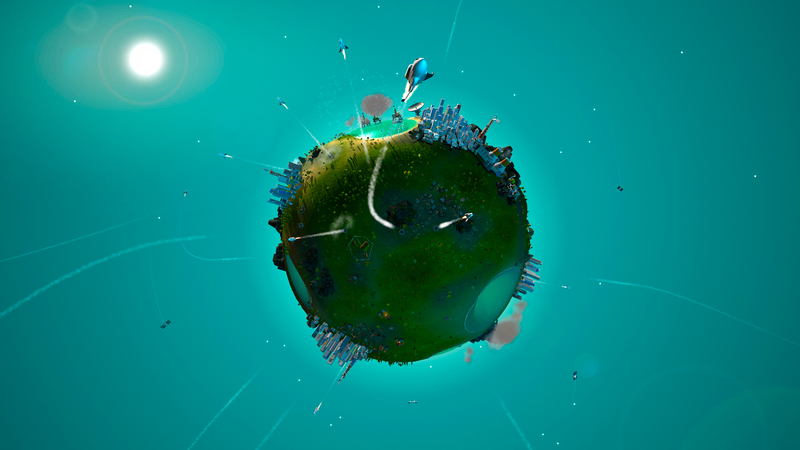 The Universim is driven by dynamic events. Natural disasters, alien visitors, diseases, war, famine, riots, and so much more can be thrown at your civilization at any time. All of these factors and how you play the game, contribute to population growth and development. When something like the plague strikes, it is up to you to quickly strategize on how you will help your civilization overcome this disaster. The way you are able to fight certain disasters changes from era to era. Cavemen do not exactly have P.H.D's in science and the knowledge to create cures, for instance. However, you can trigger disasters if you are displeased with your civilization’s choices. With every action they perform that goes against your wishes, you generate wrath, which can then be unleashed upon them at any time. We are planning to have up to 12 different viruses in the game that each have unique qualities and effects. It is probably a good idea to prepare new variants of antibiotics in advance to counter future viral outbreaks. Certain viruses will spread slowly through your population, but will be difficult to cure. Others may be easier to cure, but will spread faster and possibly cause more damage if not caught in time. You may even encounter types that fly completely under the radar and spread throughout your cities and colonies by sneaking aboard planes and interplanetary shuttles. Pay attention to the in-game News System for early signs of a breakout! Every now and then, something mysterious may fall upon one of your planets. You can then prepare an expedition to investigate these rare occurrences, if you so wish. Expeditions can be organized at any time, assuming you have the resources. The further an Expedition needs to travel, the riskier it becomes and the more resources it will require. Fallen material can be incredibly valuable to your civilization. It may be a new technology that will boost the well-being of your civilization dramatically, or it could be a meteor containing some kind of valuable resource that will open up more research options. Then again, it could also be an unprecedented disaster waiting to happen; such as an explosive compound that upon disturbing, wipes out part of the planet, or a deadly virus lying in wait. It can be seen as a high-risk, high-reward kind of system. One more feature that we are really excited to implement is the Dynamic News System. It will not only inform you about important game events, but it will also have a few incredibly humorous stories to tell. We hope to eventually give players the ability to write their own stories and events for any particular time period and share them with the community. Of course, this will be moderated. We can’t have the world invaded by inappropriately named extraterrestrials after all! These stories will be displayed in-game for everyone to enjoy. You can even construct an actual mission-based storyline for players to follow. You can also select the exact age and type of event that will trigger your news headline, or the new story campaign. With this system, every time you play the game, there will always be a seemingly infinite supply of entertaining stories in the News System. You can choose whether you want to follow someone’s storyline or simply enjoy the stream of news in Sandbox Mode. 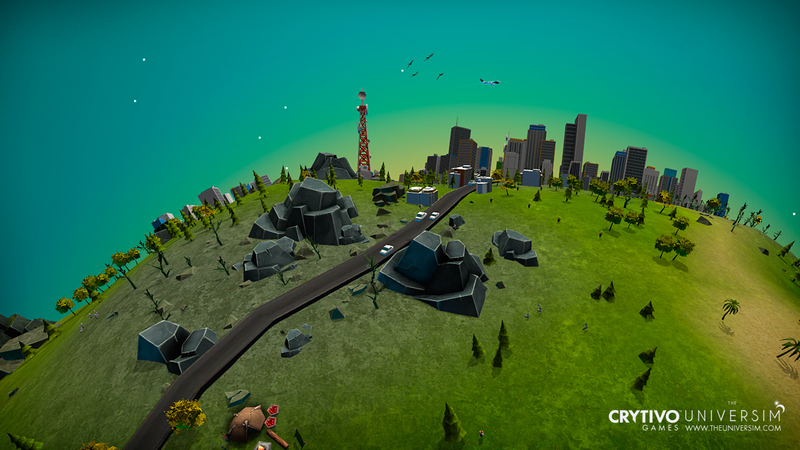 This community system is called The Universim Live News System. The beauty of this kind of game is the huge amount of freedom that we have to experiment and continue to add amazing new content before and after its launch. That is what makes all of the hard work worth it! We have only scraped the surface of what we can accomplish with the information and features listed here. With the community by our side, we can undoubtedly transform this game into the best planet management game ever created. We are always willing to listen to what you have to say. We take your feedback seriously and want to ensure that we are spending the budget responsibly and on the features YOU want to see in the final game. Looks impressive at first, but a closer look totally killed my interest in it. First off, there are no enemies, but only fagotistical "natural disasters" and aliens as a nuisance (as opposed to as a force on equal footing with you), a la SimCity. So this isn't a competitor to Civilization and the like in any way, shape or form, as many have been claiming. 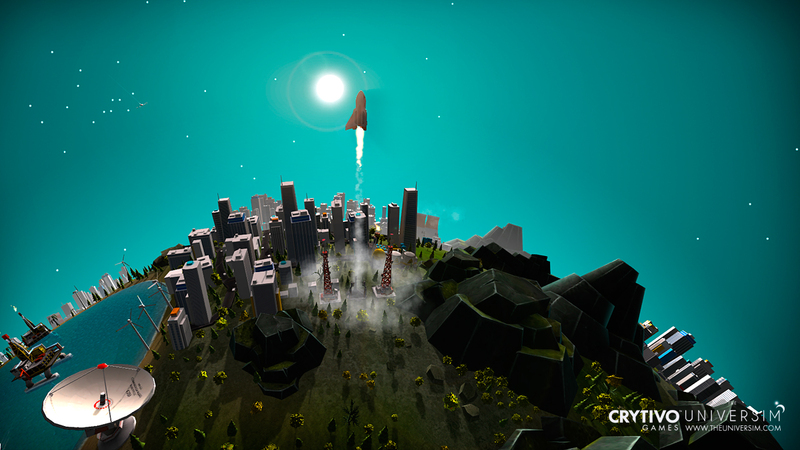 So this is basically a city-building game on a galactic scale. They hype up the historical evolution angle of the game, but all that changes as far as your population goes from age to age are a couple of ugly lines on a couple of ugly triangles, and so it will be, I am sure, with most of the rest of the historical changes. tl;dr Kickstarter fagots downgrade everything about the God genre to make their meager resources ($320,000 for a "next-gen God game" lol?) stretch to appear that they are making something 1000 times bigger than what they are actually making. Hype level zero. I wouldn't run the game if it were installed on my hard drive this very moment. Looks cool, aside from the tiny size of the planet that I was raging above. But then again I was saying the same thing about the PA trailers, and the finished game doesn't really have a limit on planet sizes, so maybe that's how it will work here too. Either way, I am looking forward to it now. We need more games that simulate entire planets. We just need a SINGLE game to feature both logistics/strategy AND tactics, instead of splitting the aspects up in separate games, and simulating them separately. WE NEED A REAL-TIME CIVILIZATION ON A GALACTIC SCALE, at the very LEAST. Sometime before I die, pls. WHAT TO EXPECT NEXT? HAPPY HOLIDAYS! Lots of cool developments in there. "You guys have to stop with the city-building nonsense and add PVP to turn this into a real RTS." Lots of good new content in there, from significant mechanical additions to aesthetic ones like grass and new voice overs. Take a look. The game is still in its early stages of development despite the Steam launch, so you should not expect an Insomnia review for a long time. Instead, I'll be keeping an eye on development and updating you on it, and once I feel there is enough content in there I will jump in and post impressions first, and finally my review. Insomnia wrote: Good, but limited, and until they add in a LOT more stuff the trailer will remain false advertising.